We continue our trip today in Indiana. Nicknamed “The Hoosier State” Indiana is the 12th smallest State in the Union, but ranks 16th in population. That makes it urban by definition. President James Madison approved Indiana into the Union as the nineteenth state on December 11, 1816. During its territorial days, the city of Corydon in southern Indiana was the State capital. 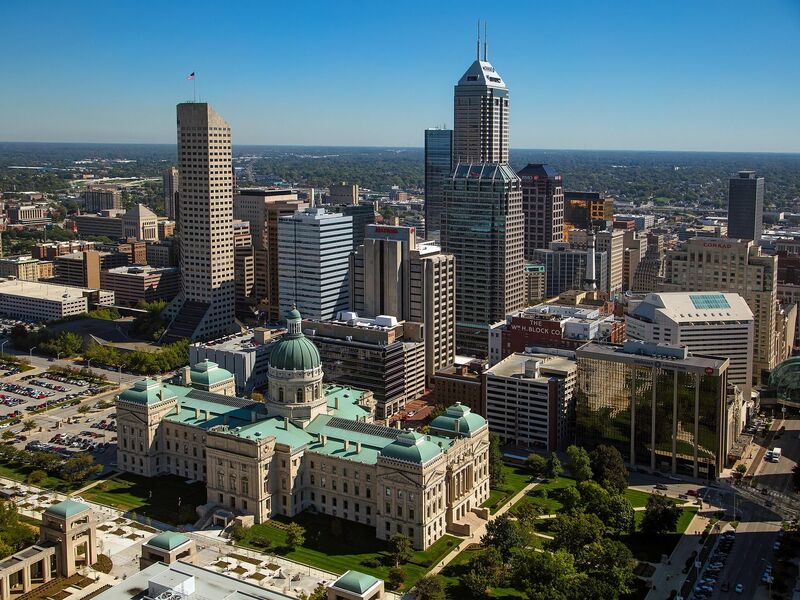 Upon receiving Statehood, the capital was moved to Indianapolis, where it is to this day. Besides being the capital, Indianapolis is the State’s largest city by a wide margin. It is joined by Fort Wayne, Evansville, and South Bend in a list of Indiana cities exceeding 100,000 in population. Marked by a rock cairn the highest point in Indiana is on 1,257 foot Hoosier Hill. It is in the rural area of Franklin Township, almost to Ohio in far eastern Indiana. The lowest point in the State is 320 feet above sea level at the confluence of the Ohio River and Wabash River in northeast Indiana. The geographic center of Indiana is on Main Street, two miles west of Avon. Indiana is bordered on the north by Michigan, and on the south by Kentucky. Ohio is at Indiana’s eastern terminus while Illinois borders the state to the west. The northwestern corner of Indiana (just 40 miles of it) is bordered by Lake Michigan. Lake Michigan plays an important role in the climate of Indiana. The northern half of the state is subject to “lake effect” snowfall from storms swirling out of that particular Great Lake. In recent years, climate change has brought about some drought in Indiana, but the historical norm for rainfall has been about 40 inches a year. Much of it occurs in the Spring and Summer. “Time.” It is a big deal to Indianans. The state is one of 13 states to cover more than one-time zone. The western half of the state does a great deal of commercial work with Chicago and wants to be in the Central Time Zone. The eastern half of the state is in the Eastern Time Zone. To make matters even more confusing, until 2006 Indiana didn’t recognize Daylight Savings Time. Fort Wayne International serves just under 300,000 passengers a year. Chicago is the most frequent destination. Indianapolis International is the major airport in Indiana, serving about 3.5 million flyers annually. Many of them are going to, or coming from, Atlanta. Military/Politics: Eugene Debs, Virgil Grissom, Wendell Wilkie, Mike Pence, and Dan Quayle. Actors: Anne Baxter, Jake Short, James Dean, Phil Harris, Buck Jones, Vivica A. Fox, Carole Lombard, Shelley Long, Jenna Fischer, Marjorie Main, Nicole Anderson, Dylan Minnette, Florence Henderson, and Forrest Tucker. Entertainers: Hoagy Carmichael, Michael Jackson, Twyla Tharp, David Letterman, John Mellencamp, Cole Porter, Red Skelton, Janet Jackson, Adam Lambert, Trevor Jackson, Peyton Clark, Trey Schafer, Axl Rose, Mike Epps, Wildabeast Adams, Drew Lynch, LaToya Jackson, Babyface, Jermaine Jackson, and Tito Jackson. Authors: Theodore Dreiser, Alfred Bertram Guthrie, Ernie Pyle, Rex Stout, John Green, Booth Tarkington, and Jessamyn West. Athletes: Larry Bird, Jay Cutler, Mick Foley, Skylar Diggins, Andrew East, and James Hellwig. The first long distance race in America was held May 30, 1911at the Indianapolis Motor Speedway. The winner, Ray Harroun, averaged 75 mph. The Indianapolis 500, self-styled “the greatest spectacle in sports” is held annually on Memorial Day weekend. The 2013 Indy 500 winner, Tony Kanaan, drove the fastest 500, averaging 187 mph. While Illinois has “Land of Lincoln” on its license plates and Honest Abe was born in Kentucky, he was raised in Indiana. Lewis and Clark embarked on their famous Corps of Discovery journey from Vincennes. The first professional baseball game was played in Fort Wayne on May 4, 1871. Indiana was part of the huge Northwest Territory, which was ceded to the United States by the British at the end of the Revolutionary War. Many Mennonite and Amish live on the farmland of Northeastern Indiana. Muncie’s Ball State University was built mostly from funds contributed by the founders of the Ball Jar Corporation. Basketball is a passion in Indiana. Regular season high school games draw thousands in car caravans through snowy evenings. The Indiana High School State Basketball Tournament is second in popularity only to the Indianapolis 500. Ladies and gentlemen, start your engines! It’s time to take a trip through the Great State of Indiana. We are going to start our trip in the far north of Indiana, just a stone’s throw from Michigan. Welcome to South Bend! We’re going to visit one South Bend site you would expect, and one you would not. This afternoon we will go across town and walk the leafy and legendary environs of the University of Notre Dame. We’ll wander through the basilica and notice the incredible amount of gold gilding the house of worship. Visit the Grotto, where you may see hundreds of candles lit by students praying for the world, the country, their families, and their own performance on finals week. Football fans should make Notre Dame a bucket list item, and see Touchdown Jesus looming over the north end of Notre Dame Stadium. Imagine Knute Rockne (or Rudy Reutigger from the movie “Rudy”) leading the troops out of the tunnel. The next morning we’re going south through rural fields to our next destination. There are two choices of things to do in Alexandria. The adventuresome can take a balloon ride over Indiana’s pastoral fields, piloted by experienced balloon drivers. It costs over $100/person but the views are unmatched. For the quirky person inside all of us, we’re going to a free attraction across town. The World’s Largest Ball of Paint started out as a stripe. It is now a behemoth in a private residence so we must call for an appointment. Is there a catch? Yes. We have to add a layer of paint ourselves, and it can’t be the same color as the last layer. Next, we are on to Indianapolis, where we find the fastest automotive speeds in the U.S. of the Indianapolis Motor Speedway and Hall of Fame Museum. First, we visit the museum and take in the history. Then, for $8.00 each, we’ll catch a bus and ride around the track! Before we leave, we’ll have our picture taken in the cockpit of one of the race cars. We found a great place to stay for $99 a night. It’s the historic Fort Harrison State Park Inn, Golf Resort & Conference Center. The next morning we travel south to the town of Dale, where we will complete our trip. We’re going to Dr. Ted’s Musical Marvel Museum. This spectacular collection embodies music contraptions from the 1800’s to the mid-1900’s. We’ll spend the night at Baymont Inn & Suites Dale for $68/night. While we’re there we’ll visit about Indiana. What a great combination of history, speed, and whimsy. As much as any State we’ve visited so far, it’s a microcosm of America. In other words, it is impressive, without taking itself too seriously. Except about high school basketball. That’s serious business here. Why is Yoga Good for Your Health?